for kids ages 6 to 12. Online music lessons is a convenient option for busy parents and homeschool families. Gentle Guitar™ is the first to offer one-to-one online music lessons for young children. Without leaving your house, your child can explore a music curriculum rich with music theory, songwriting and guitar playing. All kids must be accompanied by a parent or adult during the first lesson. Kids under the age of 10 must be accompanied by an adult at every lesson and at all times during the instruction. Participants should have access to Skype, including a mic & camera. Any device such as a laptop, tablet, or smartphone meets these requirements. Families with kids ages 6 – 8 do not need a guitar or a musical instrument to try the first free lesson. The first lesson is designed as an introduction to music. You’ll get a fun music theory activity booklet that you’ll have to print out and have handy during the lesson. You and your child will clap rhythms and learn to read, trace, color and write music notes. Families with kids ages 9 – 12 do need access to a tuned guitar to try the first free lesson. Your child will learn how to read and write music, as well as get an introduction to playing the guitar. Gentle Guitar™ are fun and professional 30min weekly music lessons designed for kids and taught in the comfort of your home to you and your child via Skype. Our special kids-music-program teaches music theory, guitar and a winning attitude and work ethic. Many parents delay introducing formal music tuition. Not everyone knows that kids get the MOST benefit from learning music during their crucial years of development. That is between birth and age 10, while the brain is highly plastic. Ages 5 to 10 is the BEST time to introduce music. So take this opportunity to find out if your child is ready! I’ll be your teacher for the introductory lesson. I look forward to meeting you! All lessons are taught privately one-on-one with special emphasis on child nurturing and development. These lessons work great to boost self esteem and are especially well suited for shy kids, those who need a gentle instructor, and those who show interest for music and creativity. We offer the highest tuition quality you can find, and best value music lessons for young kids. This free trial lesson is 100% no commitment. It’s designed to answer your questions about kids music tuition and give you a feel for what the lessons over Skype are like. The lesson is 30min and packed with fun activities and Q & A. To get the Spring Offer (35% off first month of tuition), simply mention this Spring Offer at the time of your trial lesson. Please note that we can only schedule one free trial lesson per family, so consider a good time for your family before you book the trial. If a cancelation or reschedule request is submitted prior or after your confirmed lesson time, a lesson fee of $25 USD will be due prior to approving the new booking request. Kids Get Creative at Home! 7-year-old Aaron from Chicago, USA, has just added a song to his guitar portfolio of original songs! The song is composed using 6 notes on the first 2 strings, and stars naughty monkeys. Great job, Aaron!! If your child is homeschooled, like Aaron, you too can add activities like these into your curriculum with the Gentle Guitar™ kids music lessons! Try your first music theory lesson online for free! Gentle Guitar was really the only guitar tuition service or brand that I came across that’s designed specifically for children. I love the fact that they specialize in teaching online, but that, more importantly, they know how to teach children online. This is not a skill set that a lot of companies have, believe you me! — Brandi Jordan (Owner of MamaTeaches.com) . 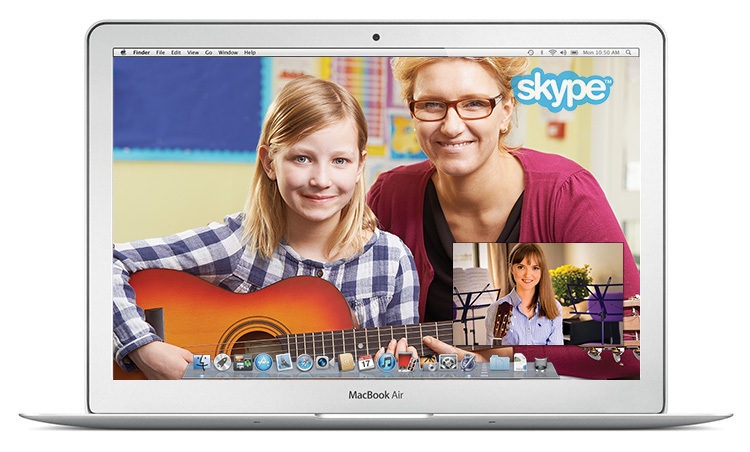 Gentle Guitar™ is fun and professional Skype guitar lessons for homeschooled kids. All you need is an Internet connection and a desire to give your child a quality music education. Children under the age of 10 must be accompanied by a parent, or a supervising adult. Book a free trial lesson now! The weekly 30min lessons are taught by a specialized teacher directly to you and your child via Skype. You get step-by-step instruction and instant feedback. You don’t need any prior music experience to make professional music lessons a part of your homeschool curriculum. But if you are musically savvy, that’s great! 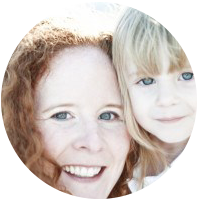 The Gentle Guitar Method™ will give you and your child flexible and fun lesson plans. I read about the program and thought it sounded like exactly what I was looking for. Lessons with a live person from the comfort of home!! The flexibility to schedule the lesson within our normal homeschool hours, not having to leave the house, and the benefit of live lessons. I really felt like it incorporates so much more than a typical guitar lesson would. I know I, like most homeschoolers, am always looking for the most content rich programs for my kids. What I love about the Gentle Guitar approach is that it is more than just learning about chords on the guitar. 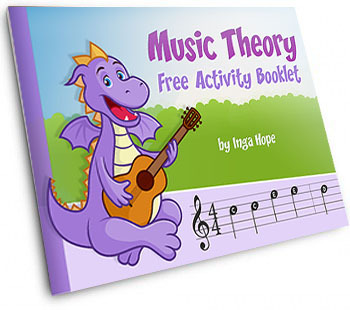 With the online instruction and the workbook kids learn about music theory too! They are introduced to whole notes, half notes, and quarter notes. They practice drawing the Treble Clef, they learn about rhythm and how the notes fit together in a measure. 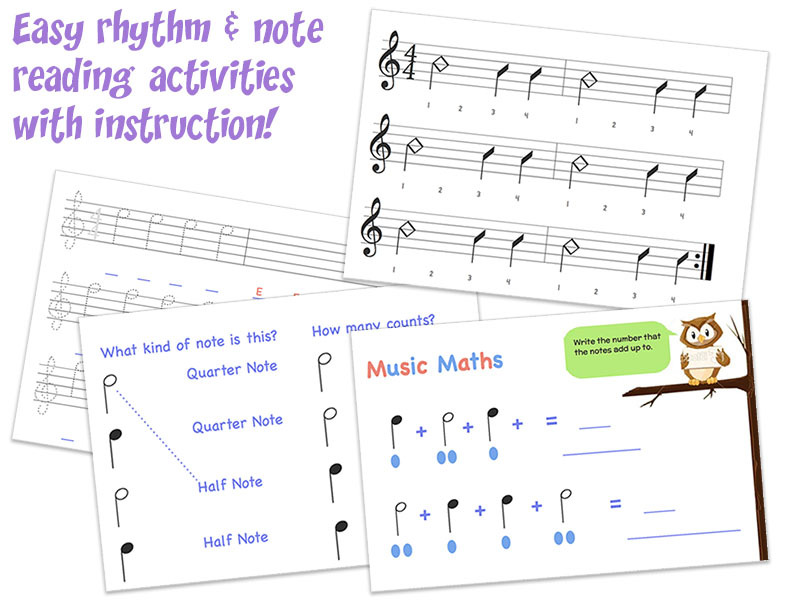 The workbook even includes exercises where they trace and draw notes and practice music maths adding together note values. These pages are a great way for little ones to practice their math and writing without even realizing it! — Krista (Krista shares homeschooling ideas at werefarfromnormal.com) . I’ve taught all over the world! Hi, I’m Inga Hope, the founder and creator of Gentle Guitar™. I started the company in 2013 in Auckland, New Zealand, out of my passion for teaching music to young kids. Today, our head office is in the heart of Copenhagen, while we teach guitar and music theory to kids around the world. Over half of our students are homeschooled all over the USA. 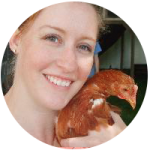 It wasn’t initially my plan to design lessons for homeschooled kids, but it turns out that our format works great for smart kids and busy homeschooling families! As a result, my teachers and I, have several years of experience teaching online music lessons to homeschooled kids. 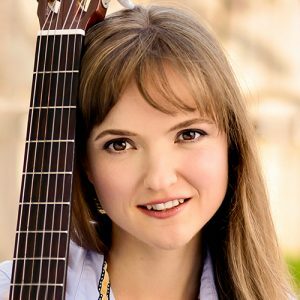 Inga, with Gentle Guitar, has a very gentle teaching style that immediately attracted my initially shy girls. As a fellow music teacher, I also appreciated the precision with which she expected my daughter to read her beginning rhythms. By the way, Gentle Guitar, is one of the few online music lessons that I found geared primarily toward younger elementary students. So, if this is something you are considering for someone in that age group, I would seriously consider starting here. They teach you basic musical notation that can easily be transferred later on to nearly any instrument, not just guitar. Oh, and you don’t even have to have a guitar for your first few lessons, which you can try out for FREE. 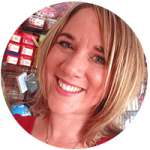 — Kathy (Kathy is a homeschool mom and blogger at cornerstoneconfessions.com) . Do you have questions or perhaps you're ready to book a free trial lesson? Book a lesson now and get all your questions answered! Yes, I'm Ready to Book!